Some how, I feel like a loosely quoted line from The Watchmen is appropriate here. I cannot condone it, but I can understand it. I wasn’t in front of a TV during the selection show, mostly because it’s mid-afternoon here on the West Coast, but from what I saw on Twitter, it sounds like an absolute cluster, and was borderline torture for teams on the bubble to have to sit and watch interviews and NBA guys who know nothing about college basketball make predictions instead of finding out whether they were in the Big Dance or not. So it’s difficult to feel any sympathy for CBS in this mess. And, make no mistake, this is a mess. All those college kids gathered for a Selection Watch party found out on Twitter long before the NCAA and CBS “announced” their fate. Teams were making travel plans and scouting before CBS got around to letting the public know what was going on. That’s not good for anyone, but maybe next year we can just get to the brackets and save the interviews and predictions until after all the matches have been announced? It’s 2016, trying to keep an embargo in place in order to keep advertisers happy may need to just go away. For anyone who actually watched this travesty, was it as bad as it seemed from reading Twitter? 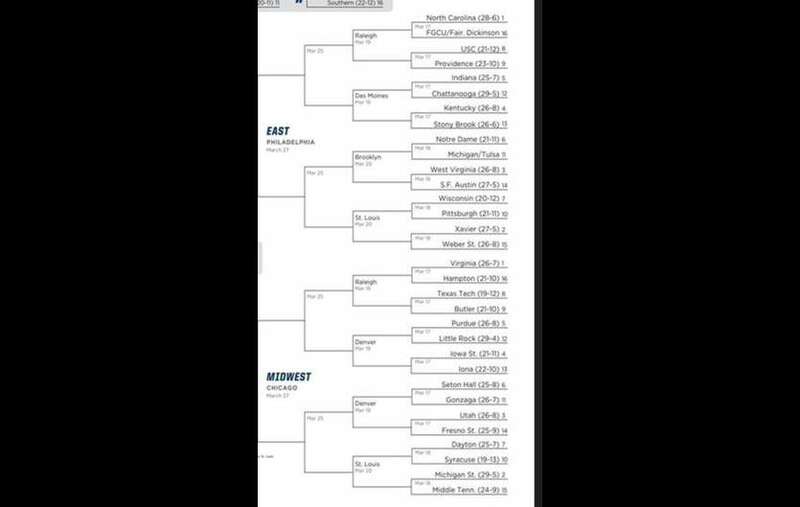 Did you see the leaked bracket before hand, or did you wait for the whole show?